Post-2014 Afghanistan is the x-factor in regional security. Beijing looks to work with Kabul to ensure stability. Afghan President Hamid Karzai is one of many foreign leaders in Shanghai this week for the Conference on Interactions and Confidence Building Measures in Asia (CICA). While in Shanghai, he met with President Xi Jinping to discuss the future of China-Afghanistan relations. Xi said that China is “ready” to increase cooperation with Afghanistan, including offering “aid to the country’s reconstruction of peace.” Xi promised that China would work with Afghanistan on the construction of the Silk Road Economic Belt, Beijing’s ambitious vision for linking China to Europe via Central Asia and the Middle East. As part of this, Xi affirmed China’s support for increased investment in Afghanistan. In an interview with CCTV, Karzai spoke highly of China’s “trust and friendship and support” for Afghanistan and said he and Xi agreed on the need for “even deeper and broader” ties. He also called the Silk Road Economic Belt “necessary for the broader development of this whole region.” Karzai said Afghanistan would support the project, because of its economic benefits and because of the bridge it would create between Central and South Asia and the West. However, plans for investment and other economic cooperation between Kabul and Beijing remain highly dependent on the security situation on the ground. With NATO troops due to withdraw at the end of 2014, there are concerns that the Taliban and other militant groups might seriously threaten the government’s control over all or part of Afghanistan. This could create a nightmare situation for China, where poorly controlled, remote areas of Afghanistan act as a breeding ground for terrorists and extremists. 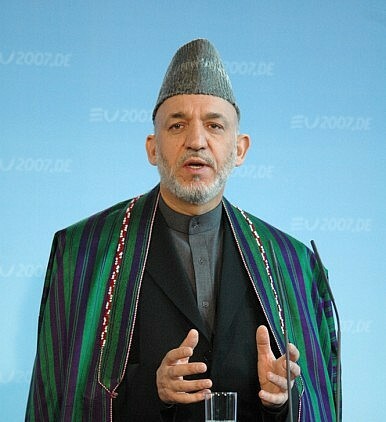 Karzai doesn’t have much longer in office; a run-off election to determine the Afghan presidency will be held on June 14. On the topic of security, both candidates (Abdullah Abdullah and Ashraf Ghani) have said that they would sign a Bilateral Security Agreement that allows for a limited number of U.S. troops to remain in Afghanistan post-2014. Karzai also promised Xi that Afghanistan will seek close relations with Beijing regardless of who wins the election. The future of Afghanistan’s security is of great concern not only to China, but to the other regional players represented at CICA. Afghanistan was on the agenda even at Xi’s meetings with other leaders. China and Russia issued a joint declaration expressing their belief that Afghanistan should “become a peaceful, stable and prosperous nation without terrorism and drug crimes,” while Xi and the President of Kazakhstan promised to work together on the Afghan situation. The future of Afghanistan is a major topic of discussion for CICA this week, and is also high on the agenda of the Shanghai Cooperation Organization. As China “marches West” with its ambitious Silk Road (and Maritime Silk Road) plans, security and stability in its western neighbors will be even more crucial for Beijing. Afghanistan is the major x-factor in regional stability, which means China will have to pay special attention to Afghan security to ensure its own foreign policy and domestic goals are met. President Ashraf Ghani will visit China from October 28 - 31 on his first formal trip abroad.